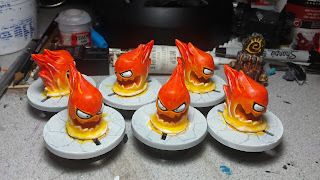 I started working on the Caverns of Roxor expansion again and if you've been following me on Twitter you've seen the Fireflow Denizens taking shape over the last week. Once the base game was finished and I knocked out the single releases, I started painting the Caverns of Roxor set with the Rocktop Gang turtles. 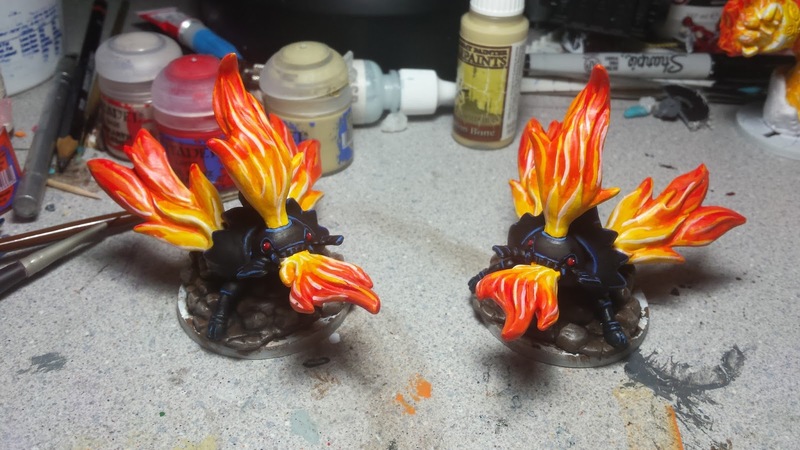 It was kind of a long process and after I was finished with them I needed a break from SDE painting, so I moved on to a couple other projects. Finally, with the arrival of Forgotten King and the tidal wave of new chibi critters, I knew I needed to get back to painting up the set. 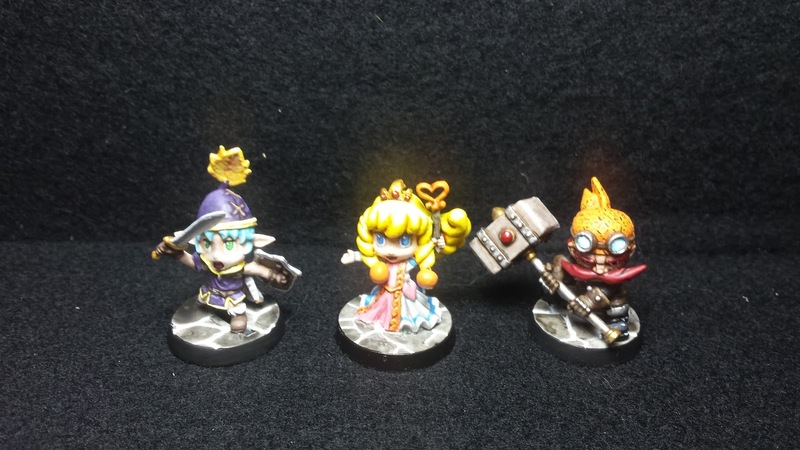 I began by easing into it with the Deeproot Scout and Star Guild Sapper heroes, I didn't paint the plastic version of Ruby at that point though, because I already had the metal version painted. But I have plans for her, that do not include stealing ideas from existing video game princesses. The Burning Gels and Fire Gels were super easy. Once the paint for the fire was done, it was just a matter of painting the eyes. I started by painting them black and then covering it with two coats of white, and finally a dot of black for the iris. was a different way of painting black that I'd never tried before, but I liked that result. The visible body section was painted Ushabti Bone then washed with a mix of Ushabti Bone & Leviathan Purple wash. 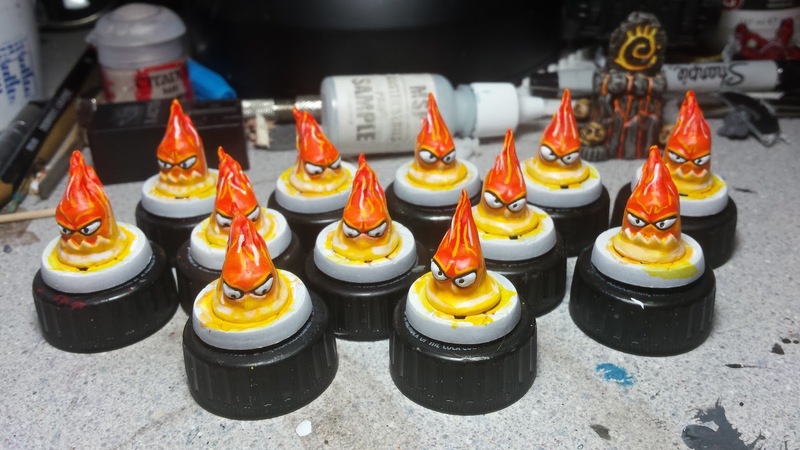 I'm super happy with them and the black shell really makes the flames pop. That's it for now. Tonight I'm going to work on the Hounds if I can get to the painting table. Then I just need to paint the Spawning Point's base and crystal, Roxor and Rockgut. So hopefully the expansion ack will be finished soon. Then it's on to Von Drakk Manor!